The Nissan Versa is one of the largest "subcompacts" on the market. 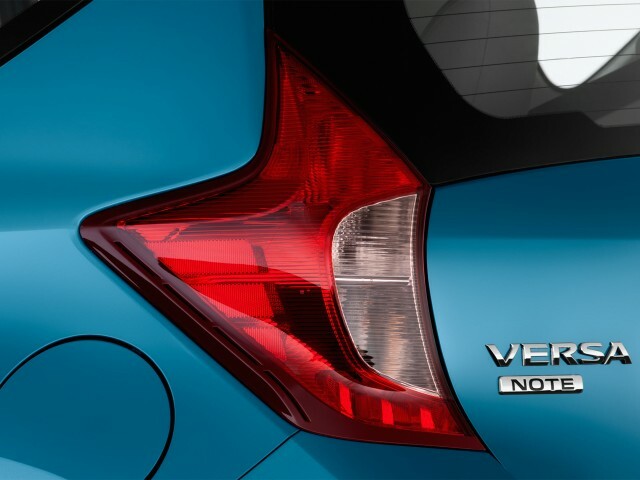 For 2014, a new hatchback model called the Versa Note joins the all-new sedan launched last year. We spent several hundred miles with a prototype 2014 Versa Note over three days of this past weekend, and came away relatively impressed. While it's not as stylish or upscale-feeling as the Chevrolet Sonic, nor as flexible inside for carrying people and their stuff as the aging Honda Fit, the Versa Note proved to be a more pleasant long-distance road-trip vehicle than we'd expected. The Note offers several distinguishing features; one of those is its gas mileage. 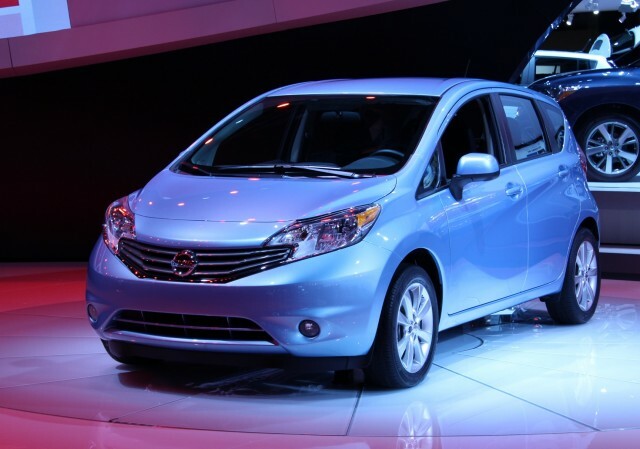 The 2014 Nissan Versa Note is rated at 35 mpg combined (31 mpg city, 40 mpg highway). Bear in mind that our 580-mile weekend trip was about three-quarters highway travel, albeit through the hills of the Catskill and Adirondack Mountains in upstate New York. That said, we were still surprised to see the car's mileage readout register 37.6 mpg at the end of our journey. Based on that, we'd expect the car to return 32 to 35 mpg in average mixed use--always depending, of course, on driving style and how aggressive a foot the driver keeps on the accelerator. Our Versa Note, a top-of-the-line model, came with the 109-horsepower 1.6-liter four-cylinder engine that's used in all Versas, paired to a continuously variable transmission (CVT). A five-speed manual gearbox is also available, as is an ancient four-speed automatic (both only in entry-level Versa S models). The Versa isn't a quick car, with a 0-to-60-mph acceleration time of more than 11 seconds. That's the tradeoff for cabin space and fuel efficiency, it appears. In driving, though, it's peppy off the line and up to 20 or 25 mph--making it more enjoyable to drive in the city than on highways. But it has some fairly large flat spots where acceleration produces ... well, not much ... until the driver floors it. Then the engine revs up from a whine to a howl, and the Versa Note slowly gathers momentum. 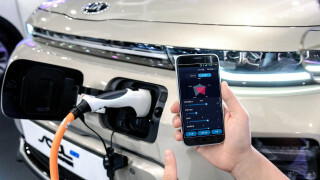 There is also occasional "rubber-band" feel as the transmission struggles to keep pace and change ratios during quick acceleration and braking. It only comes up occasionally, but it's the one time we would have preferred a conventional automatic to the CVT. Like many new cars with higher-pressure tires for better fuel economy, the Versa Note is also sensitive to road surface. On smooth, fresh asphalt, the cabin is quiet and mechanical noise is muted. But on rougher concrete or aggregate surfaces, tire noise rises enough where occupants have to raise their voices to talk to each other. It's not uncommon in entry-level cars; not only is sound insulation costly, it's heavy too. We like the styling of the Versa Note hatchback far better than that of the Versa four-door sedan, which manages (to our eyes) to be slab-sided, overly curvaceous, and ill-proportioned all at once. The Note has far more European styling, with a steeply raked windshield, a wedgy nose, and crisp lines that make it look modern without being extreme. And increasingly rare for most new cars, it had good visibility out in all directions--including the rear three-quarter view, with third windows of actually usable size. Inside, the cabin is plain and straightforward, made of hard vinyl and plastic. 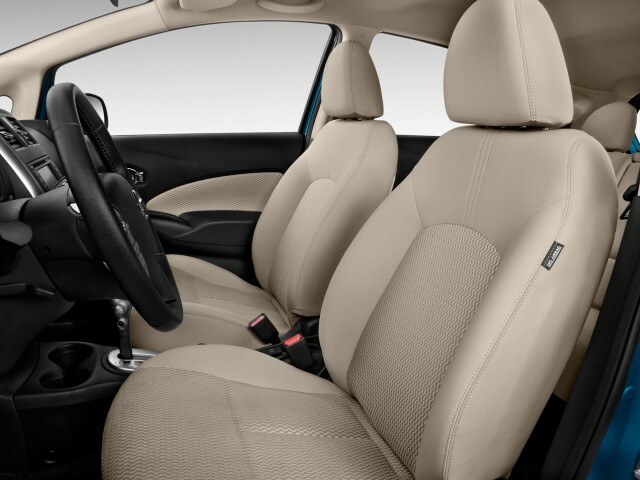 Our top-of-the-line Versa Note SL model had silver accents to relieve the otherwise all-black trim and dashboard, along with grey cloth seats. The overall effect is more rental car than stylish subcompact, but it's not hideous--just kinda dull. We did like the chrome-loop door handles, one of the few unusual and stylish touches inside the Note's cabin. At first, the front seats felt a little narrow and round-topped--rather like sitting on an ottoman. Their backrests were well-bolstered, though, and after 12-plus hours in the car over two days, we gave them a definite thumbs-up for comfort and support. 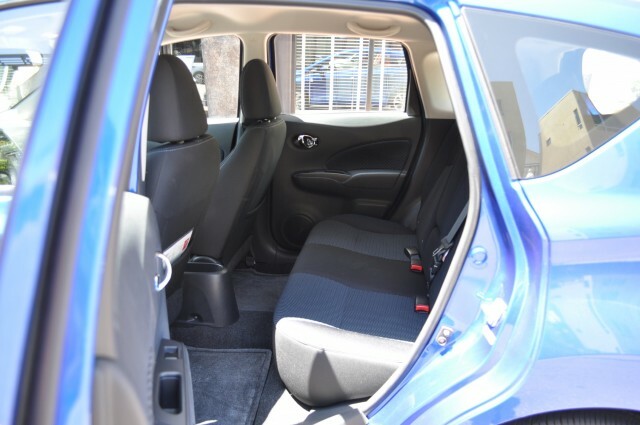 The 2014 Versa Note is big inside for a subcompact--especially rear legroom. Four adults can travel comfortably in it, and there's a decent load bay that holds 14.9 cubic feet of cargo. Our SLmodel included what Nissan calls a "Divide'n'Hide" movable false-floor platform that can be positioned several ways to hide some types of cargo, and raise others off the floor. While there's no center storage bin--and just one armrest, folding down from the driver's seat--the long center console includes two cupholders, a smartphone-sized slot, and an open bin at the rear. 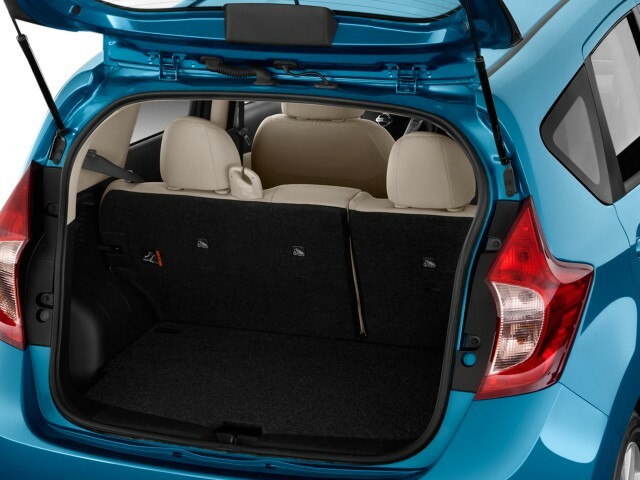 Combined with door pockets and two separate "gloveboxes" in front of the passenger, the Note offers good storage for all the stuff you accumulate on a road trip. And that same console (standard on SL models) includes not only an audio-in jack, but a 12-Volt power supply and a USB port as well. Over our lengthy trip, one factor that surprised us was the tiny gasoline tank. We managed to run the car down to the point where no remaining range was given--the low-gas warning light simply flashed continuously. Rolling into a gas station at our destination, breathing a sigh of relief, we managed to put in a stunning ... 9.9 gallons. And, in fact, both versions of the Nissan Versa have tanks of merely 10.8 gallons. Their relatively high fuel efficiency compensates for that, to some extent, but we barely squeaked out 300 miles on the tank. It got us wondering about other cars with small tanks. The Versa models have larger tanks that, among others, the Scion iQ (8.5 gallons), Smart ForTwo (8.7 gal), Mitsubishi Mirage (9.0 gal), Chevrolet Spark (9.2 gal), Toyota Prius C (9.5 gal), Fiat 500 (10.5 gal), and Honda Fit (10.6 gal). But the Versa Note's 10.8 gallons is smaller than the Toyota Yaris (11.1 gal), Mazda 2 (11.3 gal), Hyundai Accent and Kia Rio (11.4 gal), Toyota Prius Liftback (11.9 gal), Ford Fiesta (12.0 gal), and Chevrolet Sonic (12.2 gal). The moral is: Pay attention to the gas gauge, but enjoy those low-cost up-to-the-last-drop fill-ups. Our 2014 Nissan Versa Note SL carried a base price of $17,690 (the lower-spec mid-level Versa SV trim is $1,700 less). The Versa Note SL includes the center console, a fold-down rear-seat armrest with cupholders, the adjustable cargo floor, smart 16-inch alloy wheels, front fog lights, variable intermittent wipers, heated front seats, smartkey with pushbutton start, and the horn-based "Easy Fill Tire Alert" system. On top of that, it also carried the SL Tech Package, which replaces the standard SL's 4.3-inch dash display with a 5.8-inch color touchscreen, voice-controlled audio and navigation systems, real-time traffic and weather information, Google Send-To-Car destinations, Bluetooth streaming audio, and Pandora streaming radio--though, annoyingly, only for iPhone users. The Tech Package ran $800, so with a mandatory $790 delivery fee, the bottom-line total on our 2014 Versa Note SL was $19,280. 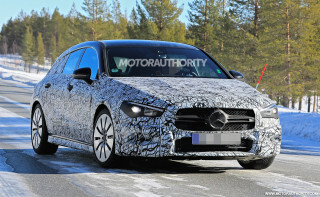 Because it was a prototype car (# 0026, in fact), we're overlooking the badly mismatched alignment of the left-front fender where it butts to the windshield pillar. The loan documents clearly stated that "many details such as...fit, finish, and assembly quality may not be up to production standards." Indeed. For more details, specifications, and pricing information on both Versa body styles, see the 2014 Nissan Versa review on TheCarConnection.com.